Hoppo Bumpo: Time for an upgrade? When quizzed about the game they were playing, Argy and Bargy told me they were speaking to each other on Skype. 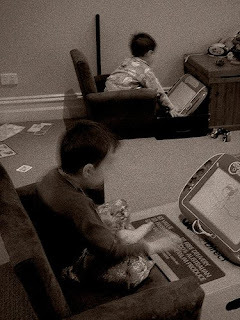 Do you think I should tell them that if they get the latest version of the Skype software, they won't need to draw each other's picture on an Etch-a-Sketch? I think that is just fabulous. I'm pretty sure their etcha-sketch portraits are better than the skype picture anyway. Hilarious! We've taken to entertaining Jack by getting him to watch Skype on his dad's computer while I wave at him on my computer... on the other side of the room. That is AWESOME! Kids are so creative. I'm extremely impressed by their ingenuity! Then again, nothing surprises me regarding Argy and Bargy antic-ry. That's great. The things our kids know nowadays. Charlotte was trying to tell me about a book the other day that we bought ages ago and she couldn't find it, so she googled the title so I could look at the cover to refresh my memory. I adore your boys. (From a distance of course). That is SO so cool. Your boys are so funny! Hahahaa! I can tell that they are used to talking to their Dad overseas this way! My boys did that for the first time today- their Dad is away for a couple of weeks. I don't know how you do this as often as you do... your partner is away a bit for work, isn't he?